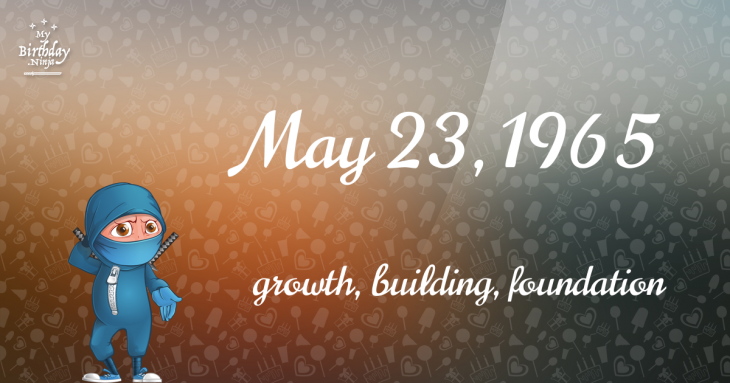 Here are some snazzy birthday facts about 23rd of May 1965 that no one tells you about. Don’t wait a minute longer and jump in using the content links below. Average read time of 10 minutes. Enjoy! What day was my birthday May 23, 1965? May 23, 1965 was a Sunday and it was the 143rd day of the year 1965. It was the 21st Sunday of that year. The next time you can reuse your old 1965 calendar will be in 2021. Both calendars will be exactly the same! This is assuming you are not interested in the dates for Easter and other irregular holidays that are based on a lunisolar calendar. There are 33 days left before your next birthday. You will be 54 years old when that day comes. There have been 19,690 days from the day you were born up to today. If you’ve been sleeping 8 hours daily since birth, then you have slept a total of 6,563 days or 17.97 years. You spent 33% of your life sleeping. Since night and day always follow each other, there were precisely 667 full moons after you were born up to this day. How many of them did you see? The next full moon that you can see will be on May 18 at 21:13:00 GMT – Saturday. Fun stat: Your first one billion seconds (1,000,000,000) happened sometime on January 29, 1997. If a dog named Dipper - a Fox Terrier breed, was born on the same date as you then it will be 232 dog years old today. A dog’s first human year is equal to 15 dog years. Dogs age differently depending on breed and size. When you reach the age of 6 Dipper will be 40 dog years old. From that point forward a small-sized dog like Dipper will age 4 dog years for every human year. Girolamo Savonarola is burned at the stake in Florence, Italy. The Netherlands declare their independence from Spain. South Carolina ratifies the United States Constitution as the eighth American state. In Brazil, four students are shot and killed during a manifestation against the Brazilian dictator Getúlio Vargas, which occurred in the city of São Paulo. Their names and surnames were used to form the MMDC, a revolutionary group that would act against the dictatorial government, especially in the Constitutionalist Revolution (“Revolução Constitucionalista”, in Portuguese), the major uprising in Brazil during the 20th century. World War II: The Flensburg Government under Reichspräsident Karl Dönitz is dissolved when its members are captured and arrested by British forces at Flensburg in Northern Germany. At least 46 people are killed as a result of floods caused by a tornado in Texas and Oklahoma. What does my birthday May 23, 1965 mean? Your birthday numbers 5, 23, and 1965 reveal that your Life Path number is 4. It represents growth, building and foundation. You are practical, down to earth with strong ideas about right and wrong. The following celebrities also have the same life path number: Ricky Wilson, Robert Marien, Wilmer Valderrama, Jay Rock, David Dillehunt, Davina McCall, Tony Plana, Curt Gowdy, Isamu Kosugi, Maggie Cheung. What is the birthday horoscope for May 23, 1965? The Western zodiac or sun sign of a person born on May 23 is Gemini ♊ (The Twins) – a mutable sign with Air as Western element. The ruling planet is Mercury – the planet of communication. According to the ancient art of Chinese astrology (or Eastern zodiac), Snake is the mythical animal and Wood is the Eastern element of a person born on May 23, 1965. Fun fact: The birth flower for 23rd May 1965 is Lily of the Valley for purity. What is the Love Match for May 23, 1965? When it comes to love and relationship, you are most compatible with a person born on July 7, 1952. You have a Love Match compatibility score of +222. Imagine being in love with your soul mate. On the negative side, you are most incompatible with a person born on March 3, 1965. Your incompatibility score is -225. You’ll be like a cat and a dog on a love-hate relationship. Arf-arf, I want to bite you. Meow-meow, stay away from me! The number-one hit song in the U.S. at the day of your birth was Help Me, Rhonda by The Beach Boys as compiled by Billboard Hot 100 (May 29, 1965). Ask your parents if they know this popular song. How many babies were born on May 23, 1965? Base on the data published by the United Nations Population Division, an estimated 116,766,061 babies were born throughout the world in the year 1965. The estimated number of babies born on 23rd May 1965 is 319,907. That’s equivalent to 222 babies every minute. Try to imagine if all of them are crying at the same time. What is the popular baby name on 23 May 1965? Here’s a quick list of all the fun birthday facts about May 23, 1965. Celebrities, famous birthdays, historical events, and past life were excluded. 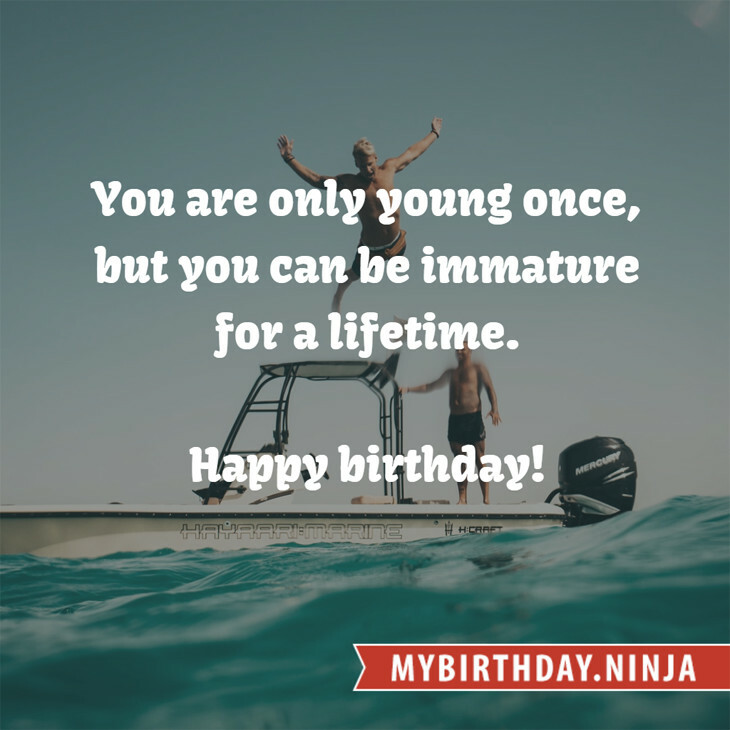 Try another birth date of someone you know or try the birthday of these celebrities: September 19, 1960 – Tonja Walker, American model, actress, and singer; October 14, 1952 – Rick Aviles, American comedian and actor (d. 1995); August 31, 1979 – Mickie James, American wrestler and singer.